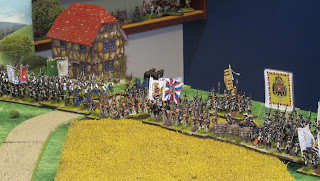 This week's game was my take on a refight of the small and not very well known battle of Strehla, between a smallish Prussian force under GL von Hulsen and a considerably larger Austro-Reichsarmee force under Reiksmarschall Karl Friedrich Count Palatine Zweibrücken-Birkenfeld. Robbie and John the Red came up to play the game. This was John's first experience of Honours of War so we agreed that the Austro-Imperial army would have two players in order that there was someone 'experienced' to guide him. 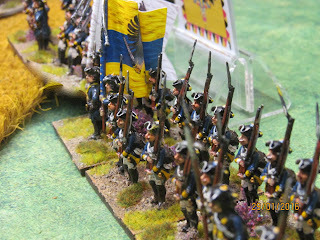 I offered Robbie the Prussians but he declined, so having 'picked sides' we were ready to start. This map is also from the Kronskaf site. * indicates superior troops, ** inferior. 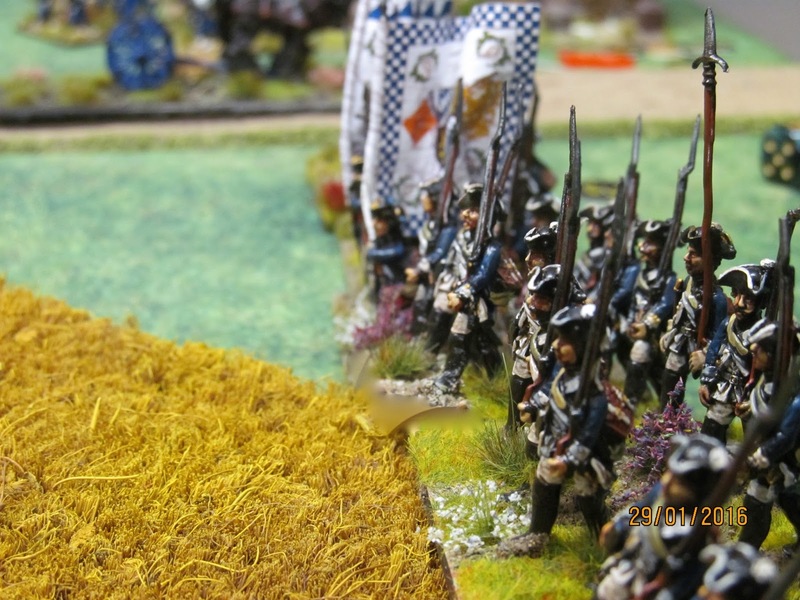 In the rules, the Reichsarmee (Imperial) troops, with a few exceptions, are not particularly good when compared to, say, Austrians, let alone the Prussians! 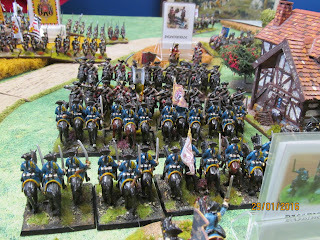 Nevertheless there were lots of them, as they outnumbered the Prussians over 2:1 in infantry and cavalry, but not in guns. Hulsen's force had 35 cannon and howitzers, including 30 12pdrs! An overview of the battlefield, with the Prussian batteries and two battalions on the Durreberg. Zweibruken's corps and Zettwitz's cuirassiers can be seen in the far right distance. Just off picture to the right were Gaudi's command. Stolberg's command was due to enter on the road bottom right, and Kleefaeld's Auxiliary corps on the road bottom left. 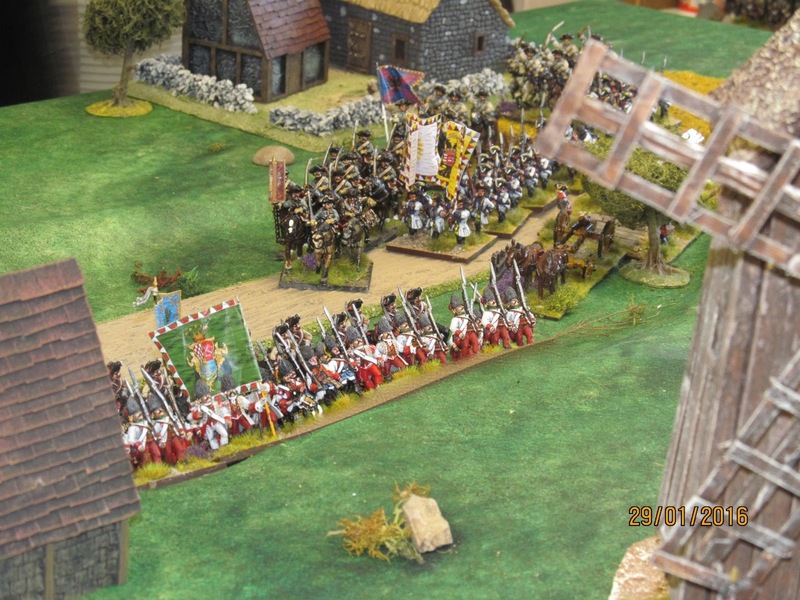 Stolberg's troops under Robbie make an entrance. 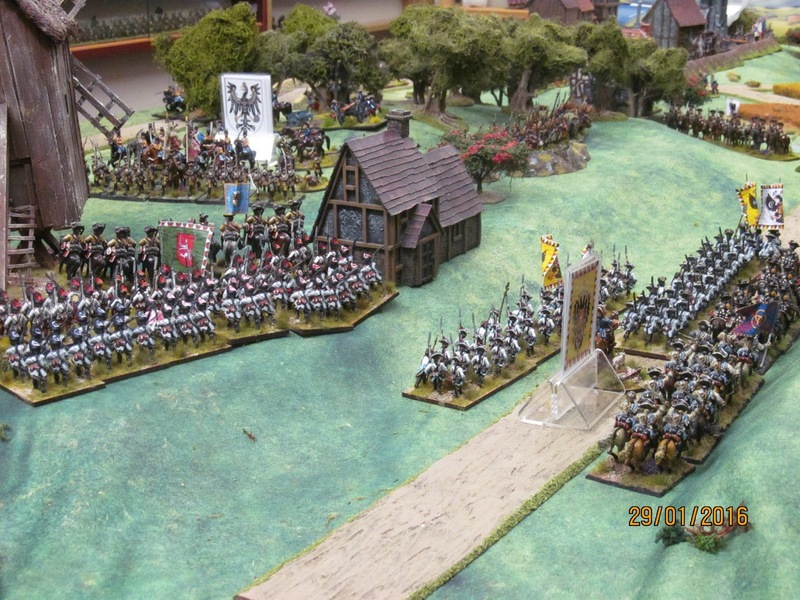 The two Reichsarmee infantry units are the Rot Wurzberg and Pfaltz-Zweibruken regiments. 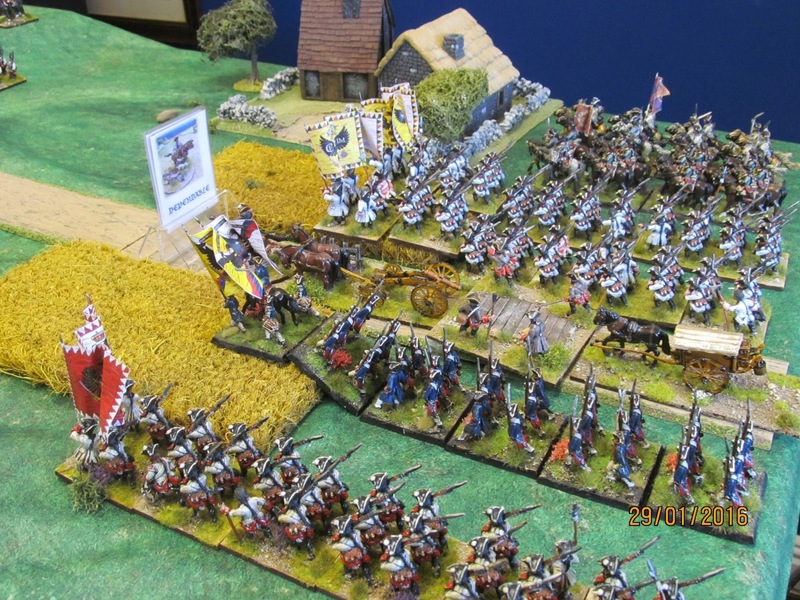 In the distance the Wurttemberg and Ansbach dragoons are also Reichsarmee contributions to the army. The main Reichsarmee command, led directly by Zweibruken, a lone Austrian (Hungarian) regiment amongst five Imperial ones. 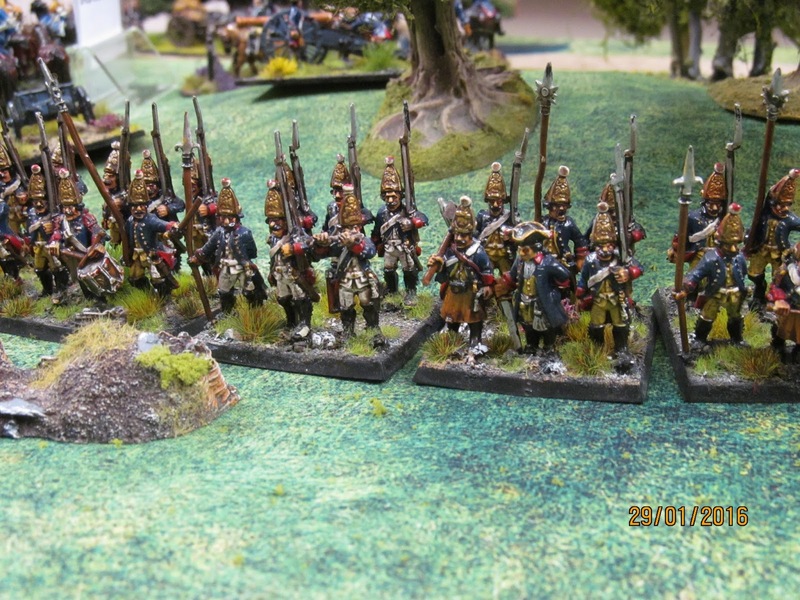 Only the Hesse-Darmstadt Leib-Grenadiers, in the centre, were rated as 'standard', the others being 'inferior'. Prussian IR16 Graf zu Dohna and IR28 Herault de Haultcharmoy hold the earthworks covering Strehla. 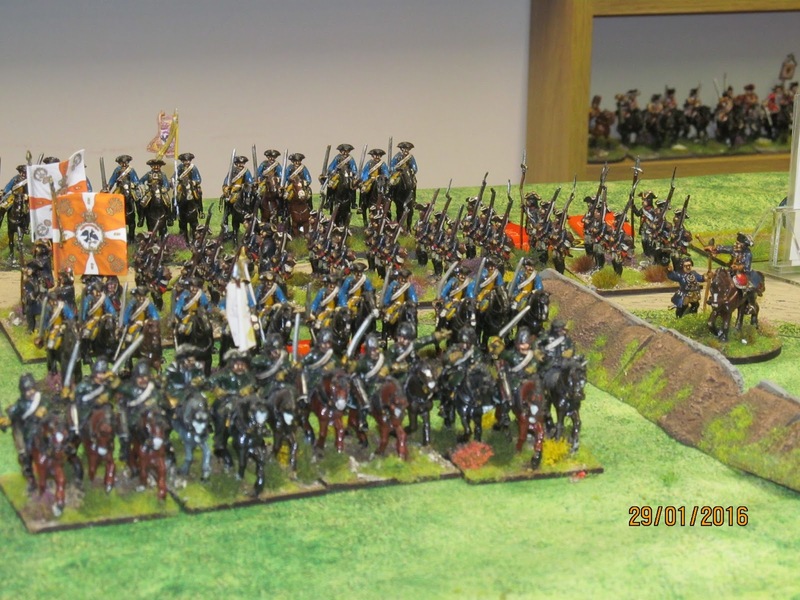 Zettwitz's cuirassiers, Austrians on the left and Imperial on the right. 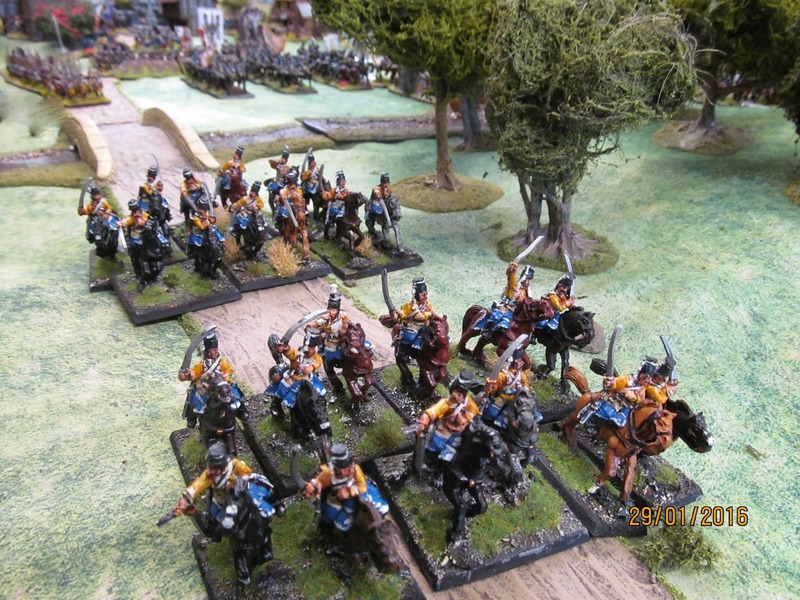 Although the latter were not the best troops by a long stretch of the imagination, combined with the Austrians they should have been more than a match for the fewer Prussian cavalry. Immediately, the Malachowski hussars (HR7) redeployed to the Prussian right wing to support the troops on the Durreberg. 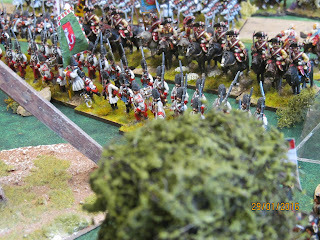 The battalion of the grenadiers from Strehla in the distance are also formed up ready to move over the river. The extreme Austrian right flank advances against Strehla. 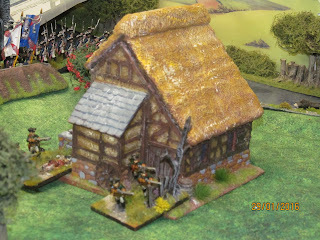 In a sharp engagement with the Prussian Jager in the village of Klein Rugeln who through some very good dice, the leading Reichsarmee battalion is broken and flees through the Hungarian battalion behind it. 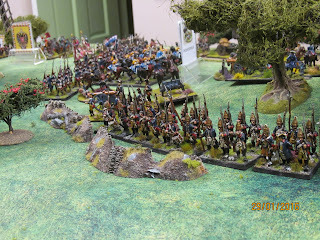 Grenadiers from Guasco's corps sweep round the flank of the Prussians on the Durreberg, while Stolberg's corps makes painfully slow progress in the rear. 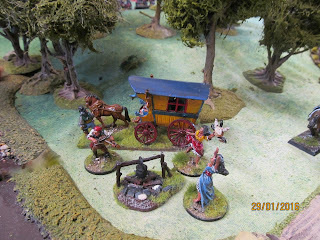 A gypsy encampment on the outskirts of the wood on the Durreberg. For them, life goes on.....music, dancing, wine, comic thigh slapping, shouts of "wench, bring me my wine" as they pick their teeth with wicked-looking knives (and that's just the women) and the whizzing sounds of bullets flying past! On the left the Prussian artillery had been pounding away at the Imperial troops to their front while the howitzer had been trying to drop shells onto the Austrian cuirassiers, and managed to score one or two hits. As the two bodies of cavalry closed, the Prussian dragoons (DR1 von Norman) declared a charge which the Austrians countered. 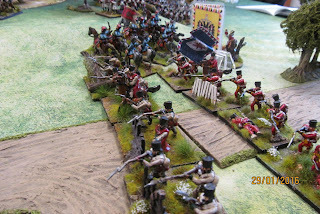 The damage to both sides was high, and the two units were forced to withdraw after the initial clash. 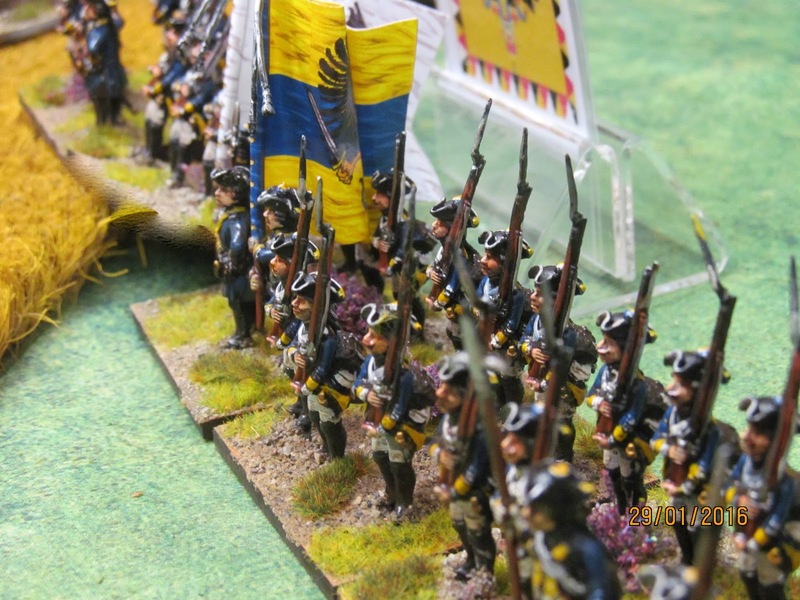 On the far right Stolberg's corps was still making slow progress but his leading units had reached the ridge. 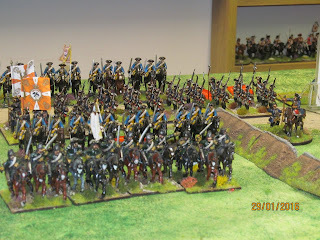 Throwing caution to the wind I ordered my hussars to charge the Rot Wurzberg regiment which was still in column of march. My hussars were in turn charged in the flank by the Austrian hussars. Robbie had thrown a '6' enabling them to make two moves, which was just pure good/bad luck depending on which side you were on. 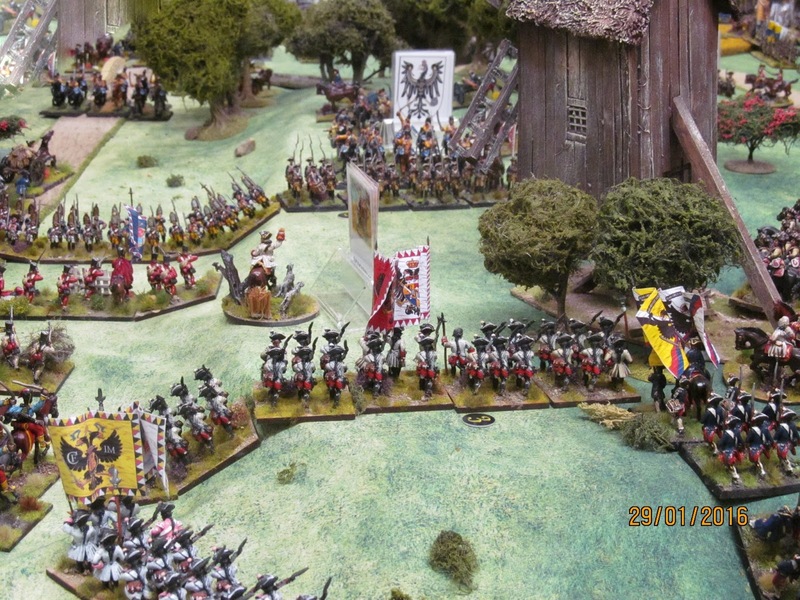 Predictably, although my hussars did some damage to the infantry, they were unable to prevent the Austrians from forcing them to retreat shaken. 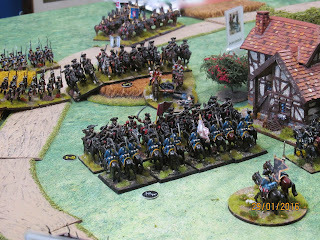 The following turn fresh Austrian and Prussian horse clashed again. This time the former were broken, although again the Prussians had to retreat in order to rally. 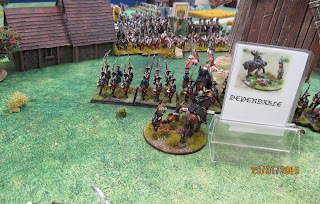 This left enemy the centre pretty much wide open save the two units of Imperial cuirassiers, but as I only had the Prussian Frei-Dragoner von Kleist, I elected to stay where I was. 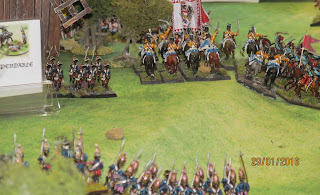 The Prussian 12pdr battery in Strehla and its target of choice, the Hessen-Darmstadt Leib Grenadiers. (well it was their first time on the table). IR18 Prinz von Prussia is deployed to the left of the battery. In the background can be seen the Prussian Jager ensconced in their village. Try as he might John couldn't get them out, although they were taking casualties. The Hungarian regiment Erzherzog Karl tying to clear the Jager out of Klein Rugeln. 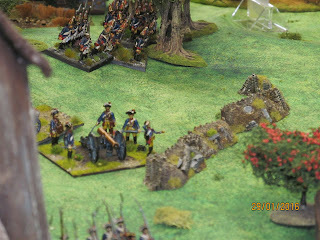 Sadly they too took to their heels after, presumably, their officers had all been picked off by the rifle-armed jager. GM von Braun takes personal control of IR19 Markgraf Karl as it readies itself to pour fire on the advancing grenadiers. 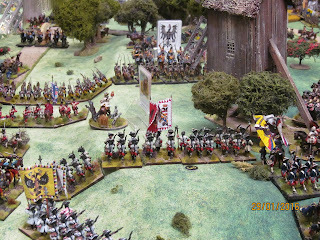 On their flank the battle between the opposing hussars is being played out, which will leave their right extremely exposed. Somewhere around this point in the game Robbie began another of his famous runs of throwing a '1' every time he chucked a dice in the command phase. This resulted in Guasco's and Stolberg's troops pretty much grinding to a halt. Oddly, those units of their's out of command managed to pass their command test and were able to move, but it wasn't enough. The Austrian Auxiliary Corps advanced as far as the village of Laas before coming into contact with the Prussian grenadiers sent by Hulsen from Strehla. They could do no more than trade fire with Prussians. John managing a smile (or a grimace) as his attack against Strehla in the far distance completely fell to pieces. At least the Austro-Imperial columns under Robbie's command were making some progress, albeit slow, and did look extremely menacing. 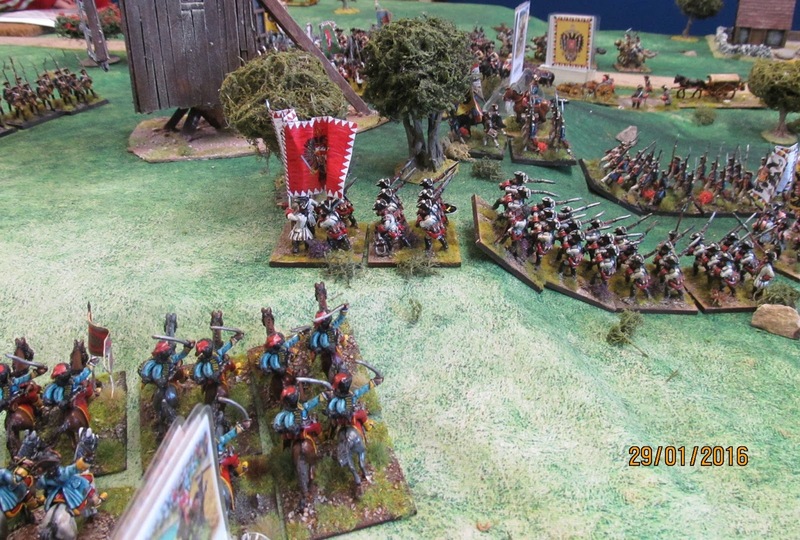 One of the Prussian guns on the Durreberg was forced to retreat due to casualties received, but the other was secure behind the old Swedish earthworks, not that it was very effective after the first couple of turns. 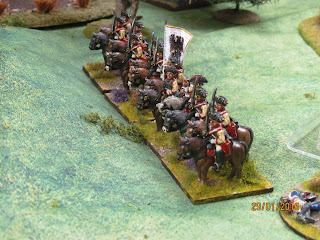 The Rot Wurzberg infantry and the Esterhazy hussars climbing the Durreberg after the Prussian hussars had been driven back. Austrian combined grenadiers supported by Imperial cuirassiers behind the village of Leibschiltz. 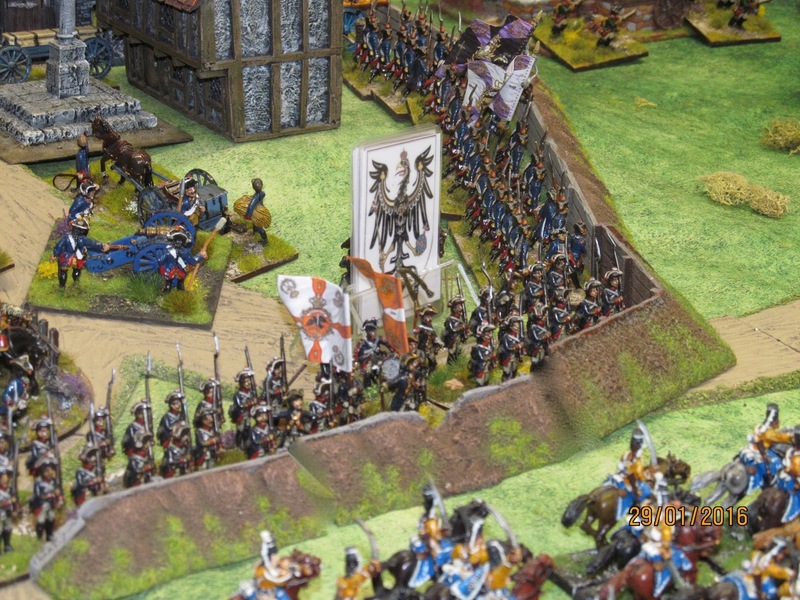 The Austro-Imperial assault on the Durreberg develops as the Prussian combined grenadiers and IR19 Markgraf Karl form a very thin line to counter the half a dozen or more Austro-Imperial battalions advancing (slowly) towards them. Robbie continued his run of throwing '1's' which slowed up his advance significantly. 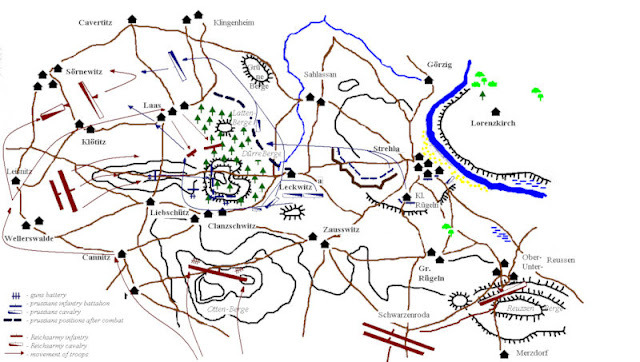 Stolberg's corps sweeps down the road, presumably to take the Prussian defenders on the Durreberg in the flank. 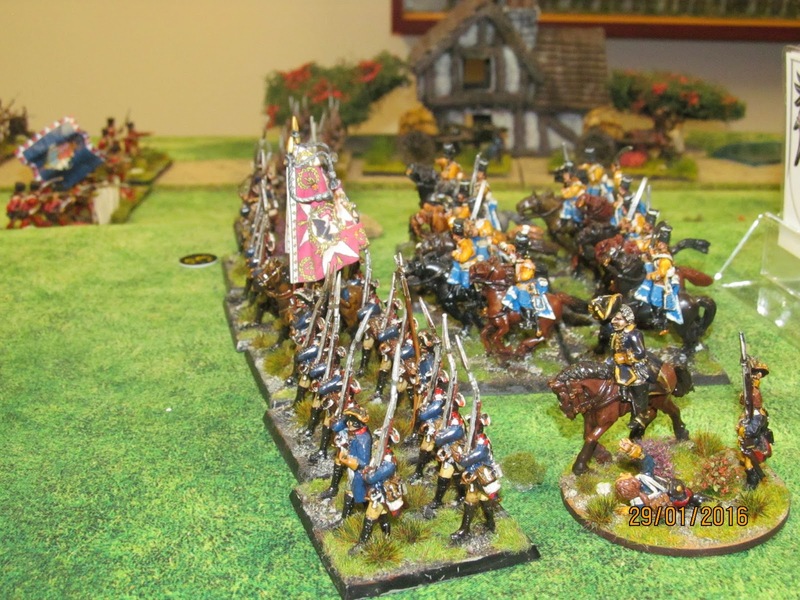 Reichsarmee dragoons, the Swabian Circle Wurtemburg regiment in the fore and the Franconia Ansbach regiment bringing up the rear. 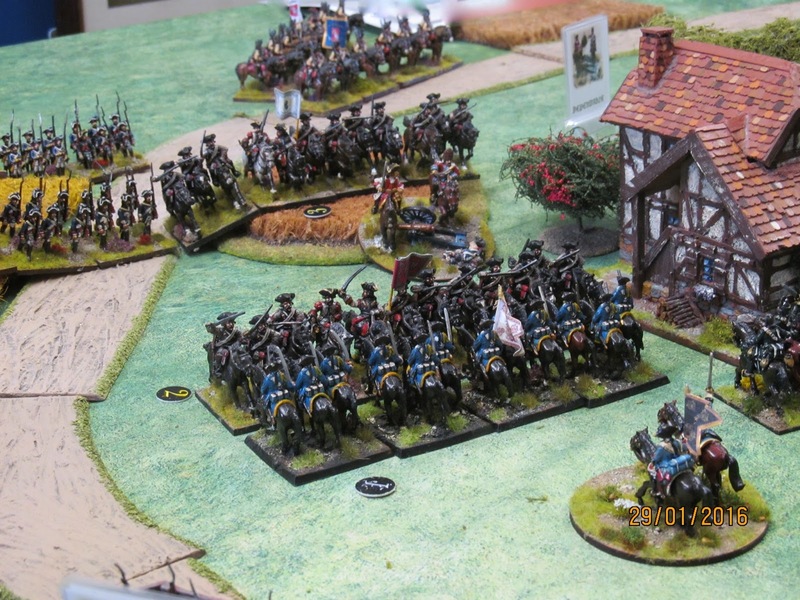 Imperial cuirassiers from Zettwitz's command poised to attack the Prussian grenadiers on the Durreberg who had left the shelter of the wood to cover the flank of the main force on the hill. Reiksmarschall Karl Friedrich Count Palatine Zweibrücken-Birkenfeld. 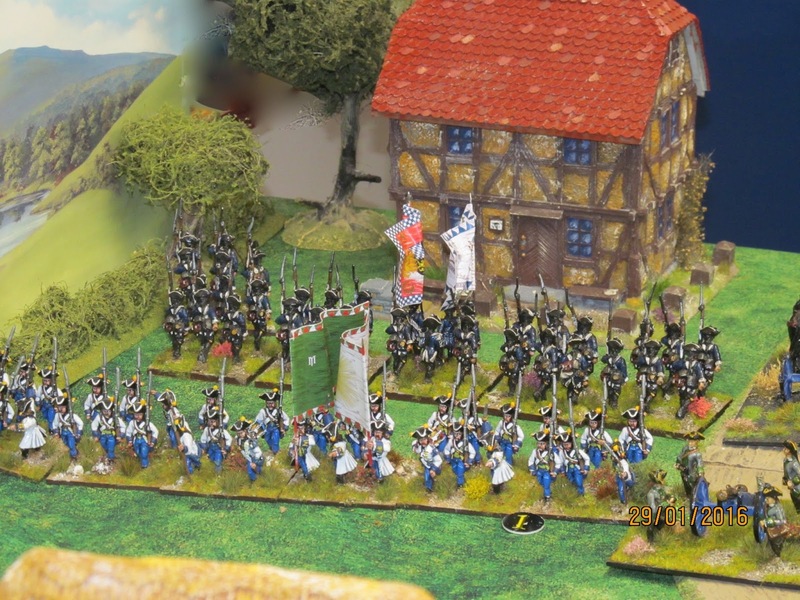 The Palatinate Karl von Zweibrücken infantry regiment rallying after the failed attempt to take Strehla. Franconian IR Varrell also advancing to the rear. 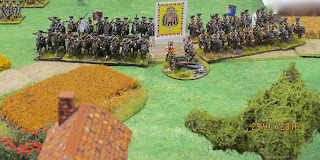 The Prussian cavalry has now rallied, with Frei-Dragoner von Kleist to their front. Hulsen has ordered IR16 Graf zu Dohna out of Strehla to support the right flank. 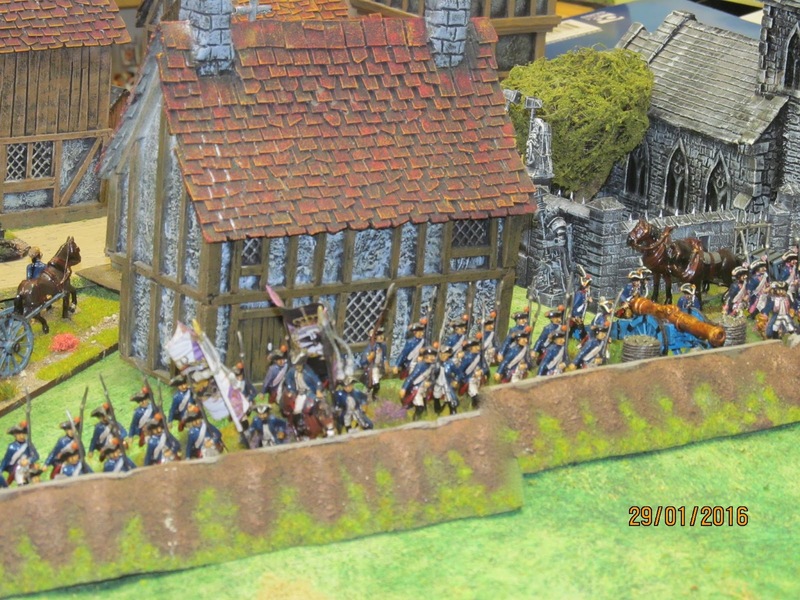 The garrison of Strehla resolutely holding the entrenchments under desultory Imperial artillery fire. Prussian Feldjager garrisoning the village of Klein Rugeln. 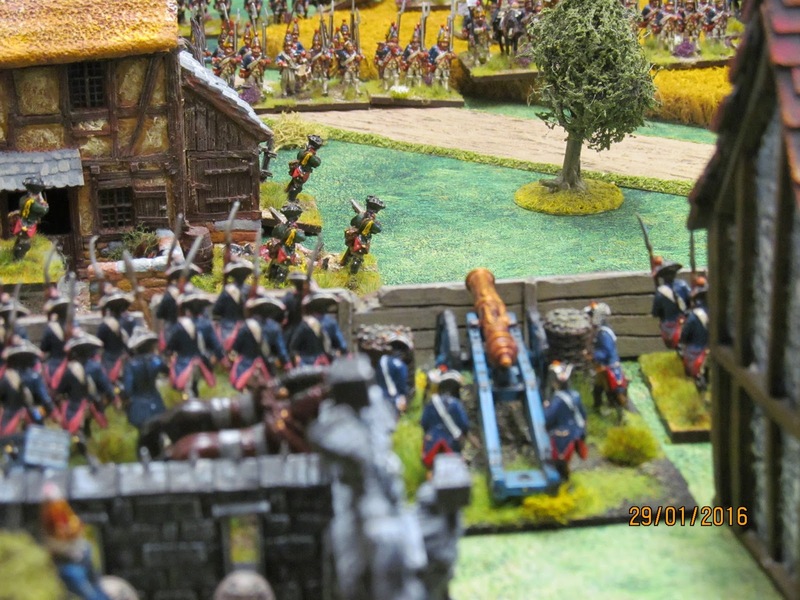 They had seen off the Austro-Imperial advance against Strehla with the support of Prussian artillery in the town. They seemed impervious to casualties from enemy musketry and close-range artillery fire although they did suffer 2 casualties (in the rules 2 is ok, 3 is time to consider withdrawing to rally, 4 forces an immediate retreat and with 5 you run away a lot!). 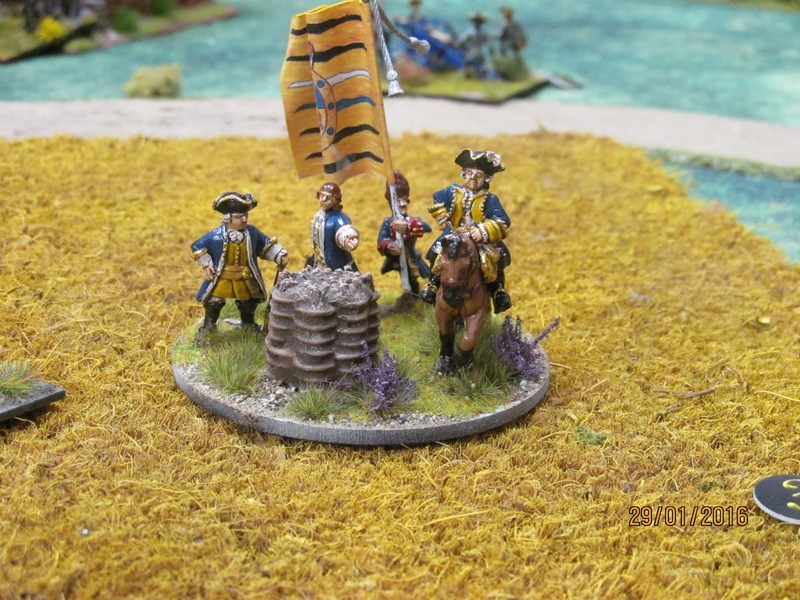 In the real battle the village was garrisoned by a battalion of grenadiers and the jager, so I felt justified in making the jager a standard-sized superior unit. 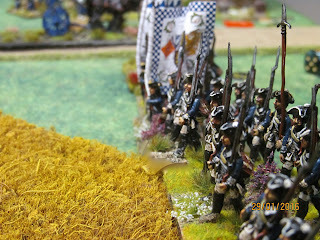 Perhaps I shouldn't have, and if I'd been playing the Reichsarmee troops I am certain I would have had a grumble! 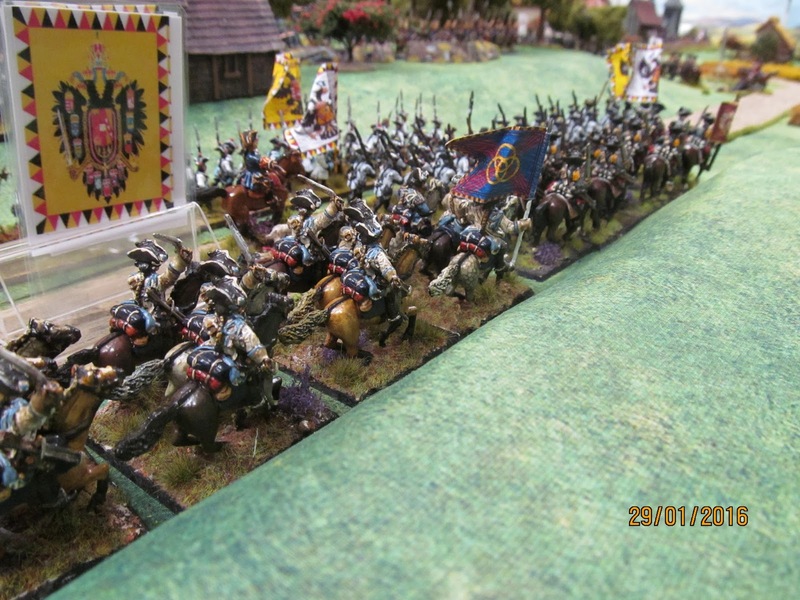 GM von Braun encouraging IR19 Markgraf Karl while the Malachowsky hussars rally behind them. Robbie had just launched his hussars against the Prussian line but they were repulsed. At this point the Austro-Imperial commanders conceded defeat as John's command facing Strehla was in no condition to make another assault and his cavalry were largely a spent force. 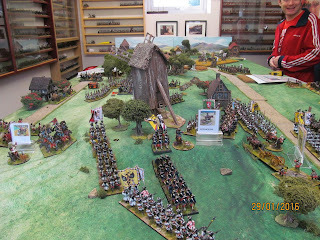 Robbie's troops were poised to assault the Prussians on the Durreberg in overwhelming numbers but were unable to co-ordinate their attacks. 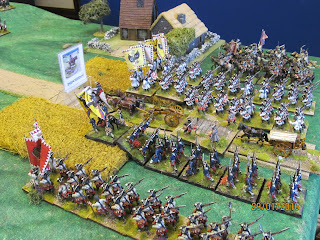 Furthermore the Prussians could safely withdraw in front of them until they reached the safety of the town. I hope John and Robbie enjoyed the game. I know I did. Despite the fact that the Prussians were outnumbered by more than 2:1, the poor quality of the Austro-Imperial commanders was a killer, especially with Robbie's tendency to throw a succession of 1's while I seemed to throw nothing but '6'! I had graded the Austrian and Imperial commanders to reflect their performance on the day of battle, i.e. most were appallingly sluggish and effected by a gross amount of inertia, so I don't feel too bad about the end result. 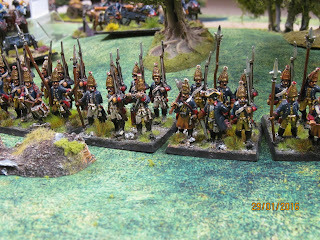 The Reichsarmee troops are generally classed as really, really bad in comparison to Austrians and Prussians in the rules, although I did give them two standard units (Rot Wurzberg and the Hessian grenadiers). I think by this stage in the war they were starting to get a little bit better but not by much. I probably (ok, definitely) over-rated the Prussian jager but I still think a determined bayonet charge by the enemy would have cleared them out of the village. The Prussians struggled a little to control the troops sent out of the town to support their right flank when they marched out of command distance but I am a great believer in command and control figuring strongly in games. It certainly adds to the tension! 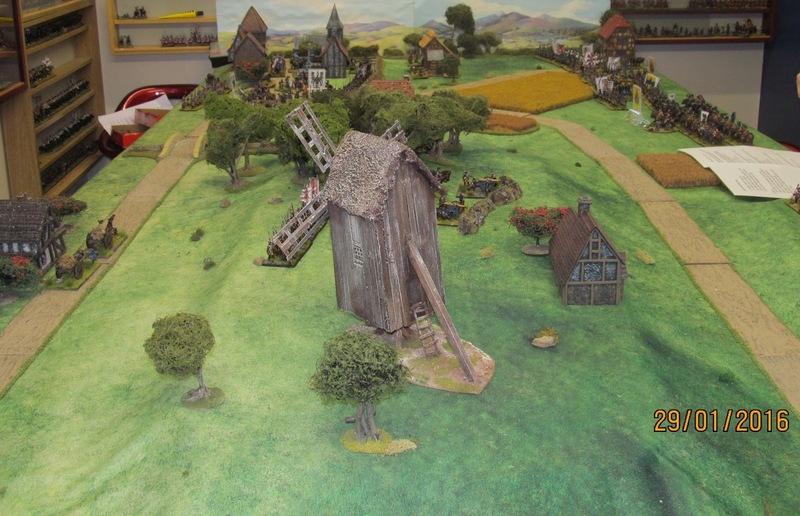 The rules worked very well, and I am looking forward to our next game on 11 February, which may well be Leignitz. (Or it may not Mark!) 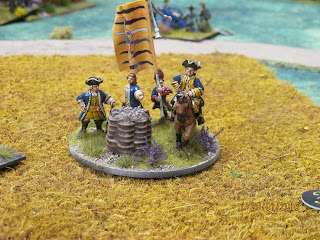 Again, I am very pleased with the look of my new mat (http://www.deepcutstudios.com). What a wonderful game! The Reichsarmee is fascinating, the terrain and scenery were beautifully executed, and extras like the gypsy encampment were a nice touch. Thoroughly enjoyable. An exceelent looking game and nice AAR. I have played the Reichsarmee and they are certainly challenging to command and rather brittle once combat is joined. Still I like a challenge! 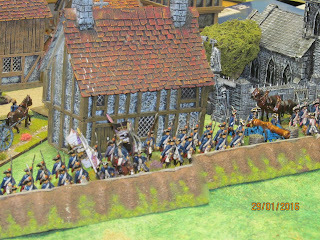 Spectacular, the mat does look rather good it really shows the figures and buildings off well. 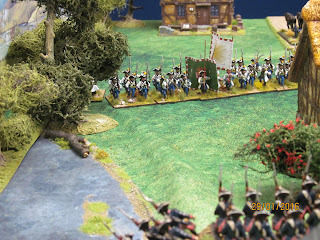 Dave is hosting a French v British bash over at GHQ tomorrow using HoW looking forward to it more now. What a joy to behold! Outstanding table in every respect! My modest bash with Phil tomorrow will look very lame by comparison I fear. Thanks very much for the kind words. On reflection I think I inadvertently stacked the odds against the Austrians and Reichsarmee, even though I was trying to be faithful to the actual abilities and performance of their troops and commanders in "real life" I think even odds of over 2:1 weren't enough. Hey ho, different dice rolls would have made it rather different. I have Honours of War coming in the mail so I was extra interested in the game. The beautiful table and figures were a bonus. Setting scenarios and interpreting what happened vs. what you want to happen in a game is very challenging. I'd say you did fine. Another astonishingly impressive game, Colin. Fantastic photos - what an amazing-looking game! A very impressive game and AAR. The figures, set up and the mat are lovely! Now Ive recovered from the abject failure of the Reichs armee, I find that John is able to pile on the agony as regards independent command throws Colin. As you will now be aware, our units out of command range would have failed even more orders if we had done the move correctly. It was a very interesting scenario, but probably impossible for the Reichsarmee as it stood.Still a good game overall. I do worry however that we have put Red John off the rules. Beautiful report with fantastic and spectacular armies, the gypsy encampment is a wonderful addition as well...thanks for sharing!